Neck pain has numerous causes from muscular strain and issues like whiplash, to a ‘cricked’ neck or torticollis. Necks can become arthritic as we get older but also get stiff and tight through poor posture. Neck pain is usually either at the top, just below the skull, or at the bottom around the shoulders. The interaction of the upper neck joints and the muscles that attach to them, is quite complex. This complexity allows us to move the head and neck around in many directions. However, this complexity means there can be several causes of pain in this area. Excessive tension of the muscles and stress on the joints causes pressure beyond what the area can tolerate. This elicits a pain response from the brain and nervous system. The joints can also become swollen and stiff, similar to how an ankle and knee can if they get strained. Pain can then influence how the muscles activity. This change in muscle activity leaves the neck prone to ongoing or recurring pain. Specific exercise and manual therapy can help relax this area and promote movement. This along with support with ergonomics, posture, levels of stress and sleep can have a positive impact on the pain response and calm the nervous system to settle down the pain response. Exercises to improve movement and help muscle function can also work to reduce pain and improve the optimal function of the area. When the initial pain episode has settled, specific exercises can reduce further recurrence of the problem. Stress on the lower neck joints/discs from overactive muscles and posture can cause pain. Sometimes it can be down to the way you have slept on a certain night. These can all triggered pain. Unhelpful postures, weakness in the shoulders causing excessive activity of the neck muscle, and stiffness in the mid back can all have an impact. There are occasions where the irritation in the neck is to the extent where the nerves coming out of the neck can get irritated and this can cause pain into the arm and sometimes pins and needles or numbness/weakness will be felt in the arm. Other factors that can influence lower neck pain can be the physiological effects of stress and lack of sleep on the body and nervous system. This leaves the body more prone to injury and pain. Strategies to help this will be discussed with your physiotherapist. Specific exercise and manual therapy can be very effective for pain relief. Treatment for any of the above conditions can sometimes be quite straight forward, only needing one or two physio sessions over 1 to 2 weeks. Other problems can take longer, depending on the complexity and interaction of all factors, and may take 6 to 8 sessions to settle over 3 to 6 months. 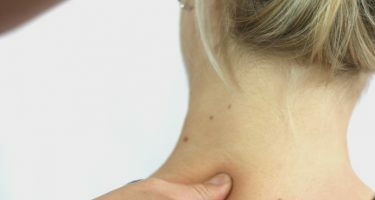 When there is considerable nerve symptom there may be the need for referral for further information like a scan but most conditions in the neck are able to be resolved with the right treatment with a physio. Once the acute stages have resolved we will help you work through the strength and preventative work as well as look at causes like posture.